I met via the internet a fellow adventurer from Uruguay and his sister. 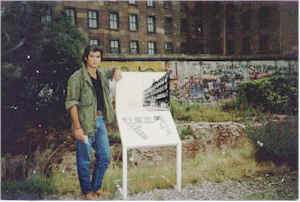 Juan was in Berlin in the exciting and historic days as the Berlin Wall was about to crumble. 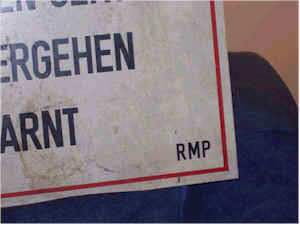 I want to share with you his fascinating adventure, as well as to offer you the once-in-a-lifetime opportunity to own this priceless Berlin Wall Border Sign, rescued from history literally as bullets flew. Were you also in Berlin as the Wall fell? Please send me your adventures, memories, thoughts and photos to post on this website! This dramatic and one of a kind piece of history is offered for sale to you for $5,000 or best offer. I’m from Uruguay in South America. In my country, it is a tradition that once you graduate from the Architecture University of Uruguay you make a trip around the world with all your graduate friends. I must tell you that it take many years of saving and earning money through ruffle sales to get to do it! We traveled in rented vans all over Europe. We were approximately 6 to 8 in each vehicle. 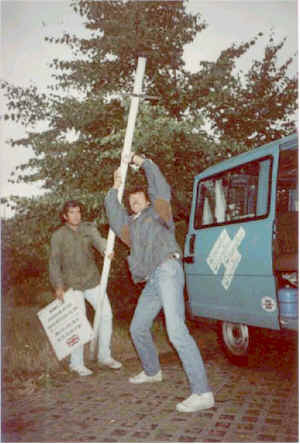 On October 28th, 1989, we crossed by ferry the border from Sweden to Communist Germany. We were supposed to pay a personal "toll" when going through Border Customs. Three of us were hiding at the end of the van in order to avoid payment. At some time, Customs Border Officials noticed that and made us get off the van and stand one next to the other in a long line. They took our passports, walked up and down the line with their gun machines hanging, reading our names out loud, shouting and screaming in what we did not know was German or Russian, who knows…We laughed, out of nervousness I believe ... we were lucky. They released us at 3 o’clock in the morning, without further notice. We started our trip towards West Germany at that time and for some reason, that we don’t know, the driver, me!!... ended up in East Berlin, when I realized I got lost. I stopped, opened the map, looked for the Brandenburg Gate (without even noticing that we were in the East side…), found the site in the map and headed that way. As the morning was breaking and there was a little light, we realized that the streets were empty, there were abandoned apartment buildings along the streets and after some time, we got to an area full of wire fences, barricades, and 50 meters from there: Voila! the Brandenburg Gate … right in front of us… but not on the other side of the wall!!! In a second we were surrounded by military soldiers aiming their gun machines at us and screaming their lungs out. They made us get out of the van, they checked the inside of the van and our passports and realized that we were only a bunch of foreign students who did not even know where they were. After a while, we shared some chocolates and biers with them and with the map open on top of the van we asked for directions. The soldiers laughed and laughed, trying to explain to us that in order to get to other side, that was 10 meters away from us, we had to travel 60 kilometers. 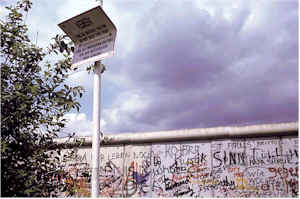 Already in West Berlin, I have it in my diary marked as July 2nd, 1989, my friend Pita and I were walking the long of the Berlin Wall, (to be more specific, on the British Sector) and decided that we wanted to take home one of the signs of the wall. We were in the Tiergarten Park, near the place where there were three crosses of people who had been killed by the communist soldiers when trying to cross the Elba River to escape. 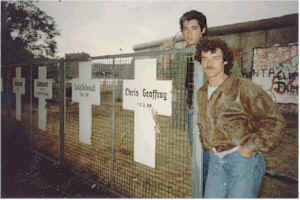 (please see the picture of us next to the crosses). The last person had been killed a few months before, that was in February 1989. 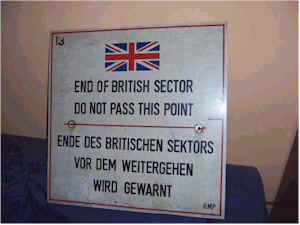 The sign that we had chosen to "take home", was located very close to the crosses; it read: "End of the British Sector". But it was plain day so we went back to the hotel with the decision to come back at midnight to do our work. And we did. We arrived at midnight, parked not too far from the spot where the signpost was located and started quietly to take it down. It was impossible. I was standing on top of my friend Pita’s shoulders, trying to loosen up the screws, with no luck at all. We were in the middle of that engagement when we heard gunshots, screams, tank movements, people running and a whole fuss. We hide behind some bushes trying not to even breathe. 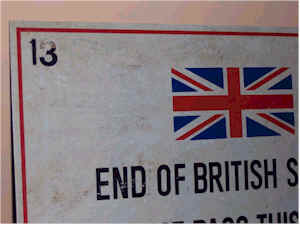 We waited in silence until the tank and soldiers left and started again our mission, trying to unscrew the sign from the post. We could never do it. We were already leaving when my friend said: "Why don’t we take the post down instead of trying to unscrew the sign?" And so we did! We had in the van a small saw, with which we marked the post at the bottom. We started kicking it, pushing and pulling it from one side to the next until it broke down. We dragged it and hide it behind a tree and my friend went to get the van. We put the sign and post in the van and left for a drink. The next day, with some more tools, we separated the sign from the post. Later that day we found out by the hotel concierge, who read in the newspapers that there had been problems among Russians, British people and the Berlin police at the border … and we were in the middle of it! This is the original sign from the Berlin Wall. It has never been cleaned. Its weight is approximately 1.5 kilos (3 lbs). The potent symbol of Communist tyranny became the site of celebration on November 9, 1989, as the wall opened for the first time since 1961. Freedom wins! Now you can own a piece of true history -- The Berlin Wall Border Sign. All website contents and photographs Copyright © 2016 - 1989 Berlin Wall All rights reserved. Article and photographs on this page Copyright © 2016 - 1989 Juan Manuel Ponce de Leon All rights reserved.